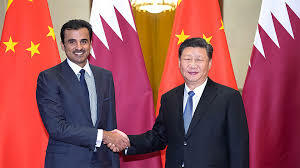 Beijing: Chinese President Xi Jinping met with Qatari Emir Sheikh Tamim Bin Hamad Al-Thani Thursday in Beijing, and they agreed to deepen the bilateral strategic partnership featuring mutual respect, equality and mutual benefit, and common development. He said China appreciated Qatar’s firm adherence to the one-China policy, and thanked Qatar for its firm support on issues concerning China’s core interests. Noting the significance of regional cooperation and stability in the Gulf for the prosperity of the region, Xi voiced China’s support for appropriately addressing differences and contradictions through political and diplomatic means, and within the Cooperation Council for the Arab States of the Gulf (GCC) and the Arab frameworks, in order to resume unity and harmony among the Gulf states. Tamim spoke highly of the performance of Chinese enterprises in Qatar, and welcomed Chinese companies’ investment in the Gulf country. The Qatari side is committed to enhancing cultural, tourism and media exchanges with China. Lauding China’s constructive stance in multilateral affairs as well as in the Middle East and Gulf issues, Tamim said the Qatari side was willing to strengthen communication and coordination with China, and deepen cooperation with the Chinese side to fight terrorism and extremism.